A sun-drenched holiday apartment just a few metres from the Sicilian coastline. This well-furnished apartment is located in a small villa, surrounded by a large, flower-filled garden, 70m from the beautiful beach of Timpi Russi, in Sciacca. The holiday home is only 6 km from Sciacca old town and port. Sciacca is home to a well-known spa, boasting pools, spa waters and steamy caves offering healing properties. In a radius of just a few km you can visit with ease: Agrigento's Temple Valley, Eraclea Minoa, Selinunte, Segesta, Erice, Mozia Island and the Aegean Islands. Perfect not only for a seaside break, but for visiting Sicily's stunning gems. Quiet and comfortable apartment in a villa surrounded by a large and sunny flower garden, 70 meters from the beautiful sandy beach of Sciacca Timpi Russians. 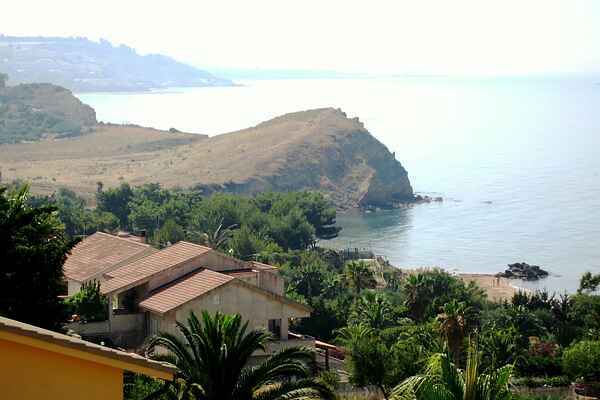 The apartment is nice and well furnished only 6 km from downtown and the port of Sciacca. The city is home to a renowned spa, with swimming pools, hot springs and vapor caves with therapeutic properties, where you can enjoy the inhalation treatments, and mud therapy in the treatment of arthritic and rheumatic diseases. Within a few kilometers away are:km 55: the Valley of the Temples in Agrigento;km 30: Eraclea Minoa; km 35: Selinunte; km 50: Segesta; km 120: Erice; km 60: the island of Mozia; km 110: the Egadi. The city is known for its colorful ceramics and ceramics that can admire and purchase art in a number of shops located in the historic center. Traditional event is the Carnival of Sciacca for his special floats, parades, dances and music has a charm that recalls the undisputed presence of many tourists. Do not miss festivals and events throughout the summer.